As mentioned earlier on this blog, IP Inclusive will be running events and seminars during Mental Health Awareness Week 2018 (14th to 20th May 2018). 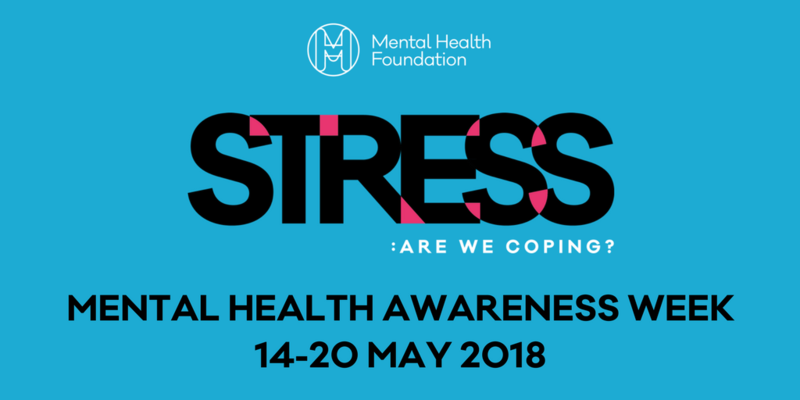 During and around this week, with help from several generous supporters, we’re putting on a series of events on topics related to mental wellbeing in the workplace.This year’s MHAW theme is “stress“, something we’re all of us familiar with and which affects the health of many IP professionals. By recognising and addressing mental health problems in the workplace, removing the stigma associated with them and giving both ourselves and our colleagues more resilience to cope with the stress we encounter, we can build more inclusive workplaces where everyone can flourish. Please get involved in at least one of our events if you can, and encourage your colleagues to do the same. The events, listed below, are taking place across the UK. Importantly, the events are free for IP professionals – and by “IP professionals” we mean in any IP-related role (including administrators, secretaries and other support staff) and at any career level. Mental health is an issue for everyone! In addition to the events on mental health, IP Inclusive and CIPA are currently surveying CIPA members to gather basic data about mental well-being in the patent profession, the extent to which stress affects that and the types of support that would benefit patent attorneys. If you’re a CIPA member, please spare us 10 minutes or so to complete the survey, which you can access here. Friday 11th May – Glasgow breakfast meeting on “Managing mental ill-health at work“, hosted by Brodies LLP (who are one of our Charter signatories). More details and registration here. Friday 11th May – Bristol breakfast meeting entitled “Mental health – the last taboo?“, hosted by Withers & Rogers LLP‘s Bristol office in association with Haseltine Lake LLP and the UK Intellectual Property Office (all Charter signatories). With speakers from the UK IPO’s mental health awareness programme, and updates and experience-sharing from regional IP firms and departments, this open forum event is for everyone within the South West IP community who is interested in promoting mental well-being and an awareness of mental health issues. Breakfast from 8 am, main event 8.30 – 10 am. Please email to register. Tuesday 15th May – lunch-time webinar on “Why looking after your mental health is so important“, run jointly by CIPA and LawCare. Register via the CIPA website. (N.B. You don’t need to be a CIPA member to join the webinar, but you will need to register with the site to book your place). Tuesday 15th May – if you’re anywhere near Manchester that day, why not join Appleyard Lees (another of our Charter signatories) and listen to the above-mentioned webinar among fellow IP professionals? The webinar will be followed by a short discussion and lunch will be provided. More details and registration here. Tuesday 15th May – lunch knit and crochet session hosted by BRANDED! in York, to create a blanket for the York charity Carecent as a gift from IP Inclusive and the Clifton Moor Business Association. BRANDED! are one of our Charter signatories. Bring along three knitted or crocheted 4×4 cm “Granny Squares” and one “work in progress” square. For more information, see our earlier post here. Friday 18th May – breakfast meeting and panel discussion on “Well-being at work“, hosted by Carpmaels & Ransford at their office in London, from 08:30-10:00. Details and registration here. Carpmaels & Ransford are also one of our Charter signatories. Tuesday 22nd May – lunch-time webinar, “Top tips for studying under pressure“, focused on the stresses of training and the qualifying exams. This is being run jointly by the CIPA Informals (the student body of CIPA) and LawCare. Register via the CIPA website. As above, you do not have to be a member of CIPA to join the webinar. We hope to see some of you at these events. In the meantime, please do all you can to get conversations going about mental health at work. And, as always, if you work in the IP professions and need someone to talk to because you’re feeling overwhelmed, stressed or anxious, please call LawCare on 0800 279 6888 (the helpline is open Mon-Fri 09:00-19:30, and on weekends & bank holidays 10:00–16:00).